Scorpions may be the most well-known arachnids after spiders, but a few other types of arachnids exist, including the tiny pseudoscorpions. Although their common names are similar and the're both arachnids, pseudoscorpions and scorpions are vastly different creatures who happen to share a list of characteristics. Scorpions and pseudoscorpions are fairly closely related, but no more so than scorpions are related to spiders, ticks and mites. Within the 11 orders of arachnids, pseudoscorpions belong to Pseuoscorpiones and scorpions belong to Scorpiones. Like all arachnids, both pseudoscorpions and scorpions have eight legs each, and chelicerae, exoskeletons and pedipalps. Unlike most other arachnids, though, scorpions and pseudoscorpions have enlarged pedipalps formed as pincers. Among the most obvious differences between pseudoscorpions and scorpions is size. Scorpions range from a half-inch long to more than 7 inches; many of the commonly encountered scorpions in the United States are 2 inches long or longer, making them easy to spot with the naked eye. Pseudoscorpions, on the other hand, reach between just under one-tenth of an inch to barely over a quarter-inch long, making them inconspicuous in most circumstances. Most are under 1/8 inch. Among the identifying features of scorpions are their large pincers and long, stinger-equipped, curling abdomens, which are sometimes referred to as their tails. The scorpions' abdomens are made up of 12 segments -- an initial seven followed by five additional segments covering the tail area -- wide at first and gradually getting thinner, ending in the stinger. The abdomens of pseudoscorpions also are made up of 12 segments, but their abdomens are proportionally wider and are rounded, with no tails or stingers. Psuedoscorpions live primarily in the tropics of the world, although several dozen species are found in the temperate United States. Most inhabit outdoor habitats where they can hunt for smaller insects and arthropods such as flies, beetle larvae, caterpillars and ants. Common habitats include birds' nests and leaf litter. 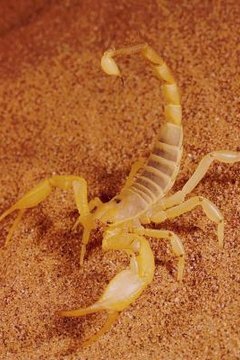 Many scorpions inhabit similar areas, except most prefer desert areas such as flats, dunes and desert mountains.